This weekend at the Museum of Fine Arts, Houston, the retrospective tribute to Sir Alec Guinness continues apace with screenings of The Ladykillers (7 pm Friday) and The Lavender Hill Mob (7 pm Saturday). Here's what I wrote about films back in 2000 on the occasion of an earlier MFAH tribute to the late, great British actor. 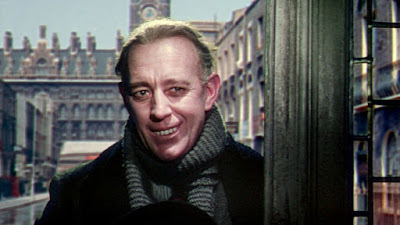 The Ladykillers (1956): Try to imagine a hybrid of Humphrey Bogart and Dr. Caligari, and you're ready for Guinness's weirdly stylish turn as a would-be criminal mastermind in this mischievously sardonic farce. Outfitted with enormous teeth -- even bigger than Matt Dillon's choppers in There's Something About Mary -- Guinness plays Professor Marcus, a vaguely creepy fellow who presents himself as an amateur musician when he rents an upstairs room in the shabbily genteel home of Louisa Wilberforce (Katie Johnson), a seemingly harmless old lady. Marcus hopes to use the room, and the old lady, while conducting a heist with a motley crew of co-conspirators. (Chief among the cohorts: Peter Sellers as a chubby-faced teddy boy and Herbert Lom, who would later play straight man to Sellers's Inspector Clouseau, as an excitable tough guy.) But the tables are turned -- repeatedly, hilariously -- as the improbably resilient Ms. Wilberforce sparks a chain reaction of comic mayhem. The Ladykillers may start out as a conventional comedy about dumb crooks and cute geezers, but the humor turns progressively harsher and darker as the thieves fall out and the body count rises. Trivia note: After directing Guinness in this movie and The Man in the White Suit, Alexander Mackendrick moved to America to make the deliciously cynical Sweet Smell of Success. The Lavender Hill Mob (1951): A whimsical caper comedy with a touch of magic and a sprinkling of melancholy, The Lavender Hill Mob finds Guinness in one of his very best roles. As Mr. Holland, a mousy, middle-aged Bank of England employee whose innocuous manner is a brilliant disguise for his criminal intent, Guinness eloquently expresses the dreamy daredevil that lurks in the heart of every anonymous wage slave. With the help of a souvenir manufacturer (Stanley Holloway) and a couple of small-time crooks (veteran British character actors Sidney James and Alfie Bass), Holland swipes a gold bullion shipment, then smuggles the booty to France in the form of miniature Eiffel Towers. The humor is mostly low-key and character-driven under Charles Crichton's direction. At the end, though, there's a dandy high-speed car chase that's fresher and funnier than many similar scenes in more recent comedies. Pay close attention during the opening scene -- yes, that really is a young Audrey Hepburn who briefly dallies with Guinness.